By assigning licenses/subsciptions (previous post) in Office 365 services are enabled per user. Most of the services are accessible via the App Laucher. The challenge is enabling a single service for example Office 365 Video. This is challenging due to the relationship between services bound by a subscription/license. By enabling services new tiles can show up in the App Launcher. When enabling services for users you want to know which services are enabled to provide the proper training and increase user adoption. Can you granularly enable SharePoint Online services? Yes, you can granularly enable SharePoint Online services if this is required! Maybe “Yes” is not completely true. Let me explain. Why is SharePoint Online different than other licences in Office 365? Just because… No idea, lets hope Microsoft will change this soon and let us more granalar enable or disable services based on licenses. But we do have a choice! 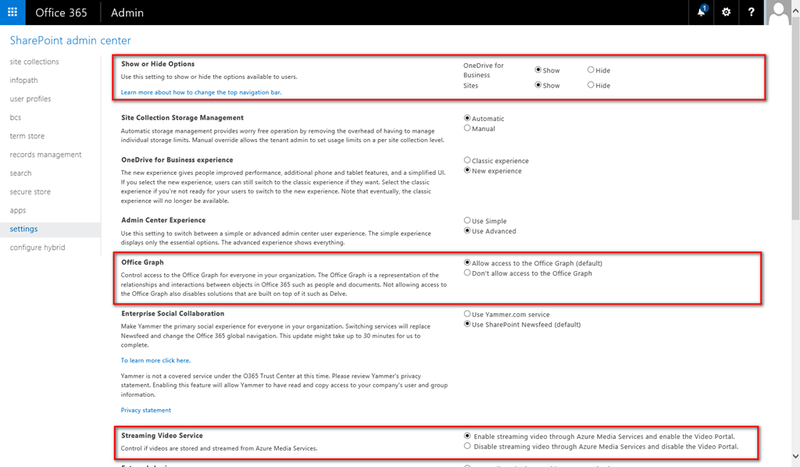 In the SharePoint Admin Center, under “Settings”, an admin can make changes to these services. It might take a while before the changes are reflected in the user interface, please be aware. By hiding OneDrive for Business the tile is removed from the App Launcher, but the service is still available! By using a direct URL (https://company-my.sharepoint.com) you can still access OneDrive for Business and use your personal storage. By hiding Sites, simular behavior will occur as OneDrive for Business. 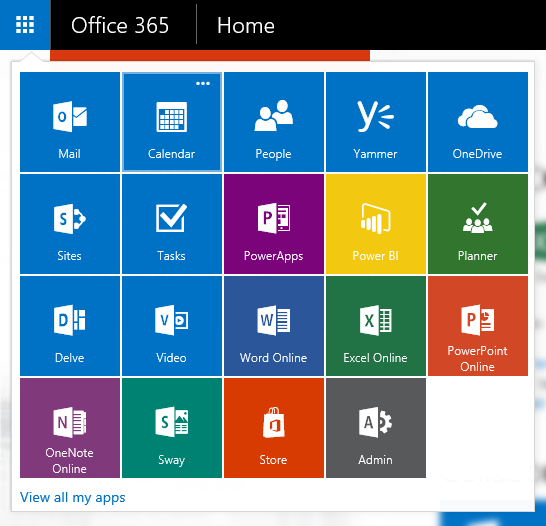 The tile is hiden from the App Launcher but by directly accessing the link https://company-my.sharepoint.com/personal/useraccount/Social/Sites.aspx the Sites page is still accessible. Disabling the Office Graph “Don’t allow access to the Office Graph” will not completely disable Delve, but will disable using the Office Graph (the backend of Delve). The Delve user profile page is accessible and needs to be! 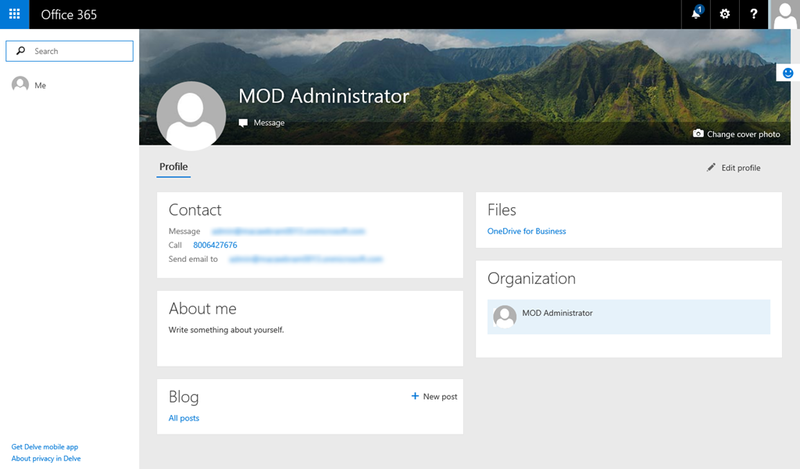 When user will click on a user profile link they will be brought to the Delve profile page. The options like “Home”, “Favorites”, “People” and “Boards” are not accessible. 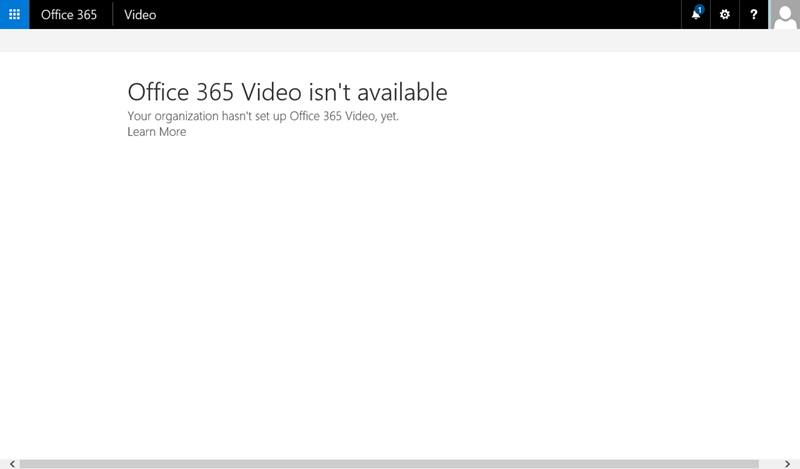 When disabling Office 365 Video the tile is removed from the App Launcher and when a user tries to access the Office 365 Video page via the link https://macawbram0013.sharepoint.com/portals/hub then a friendly message is shown.